For optimum accuracy, the relation between the measurement signals from the sensor and the dip displacement is measured, as described in this section. Before use, each sensor is calibrated to obtain the relationship between the displacement of the sensor tip and the measurement signals produced by the probe. Deviations due to assembly and manufacturing are thus greatly reduced. 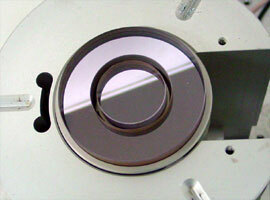 Calibration of the sensor can be performed on the CMM itself or using the calibration setup. 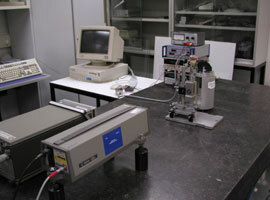 Setup used to calibrate to Gannen probe. The relationship between the measurement signal and displacement of the sensor tip is determined using a plane mirror differential laser interferometer setup. A displacement of the measurement mirror results in a displacement of the sensor tip and the resulting measurement signal is recorded. Simultaneously, the displacement of the measurement mirror relative to the reference mirror is measured using a hetrodyne laser interferometer. The process is repeated at several positions and in different orientations. When the relation between the measurement signal and displacement of the sensor tip for a particular sensor is known, it can be used in measurements.